These words were uttered during Conan O’Brien’s last show on NBC. Something interesting or entertaining was bound to happen during this final show, but I was not expecting the quote above. Or rather, I didn’t expect the sudden revelation I had when he said it. You have to have both. Working hard makes you productive and sharpens your skills. The more you work, the more you ship and the better you get. Add kindness and you’ve got an explosive cocktail. As Conan was talking I looked across the room at my wife Kelly. It occurred to me that those were the exact two qualities that had made her successful. She has a deep passion for food and has made it her living. 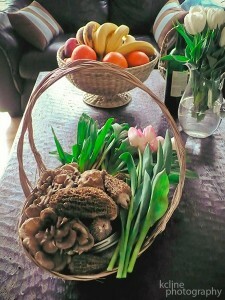 A giftbasket of mushrooms Kelly put together for a friend. Photo by Kelly Cline. Kelly works a lot, sometimes several 16-hour days in a row, doing research, cooking, styling, photographing, writing or editing. Food is on her mind 24/7. And it pays off. In the five years we have been together, I have witnessed her culinary skills and expertise grow, as she kept learning and trying new techniques. In the same time, she has also built herself a strong network of fellow foodies from chefs and restaurateurs to vendors, writers and editors. Kelly genuinely likes to help others, even when she is really too busy. In fact, we first met when she volunteered to show me around Seattle. I was in town for a week and had no idea where to go or what to see, so she offered to help. Then something amazing happened, we fell in love. When it comes to meeting new people, Kelly builds relationships instead of collecting “contacts”. If she likes you, she will go out of her way to be considerate and kind, no matter who you are. Kindness is not to be confused with sucking up to others or paying it forward and true kindness can’t be faked. It’s about reaching out and helping where your particular skills are needed, and without the expectation of compensation. Simply because you want to. Does this mean giving away your work for free? Sometimes it does. I give the interviewees on Another Passion permission to use the photos I take of them. It would be silly not to. And since I meet many different creatives, I try to connect people if I realize they might benefit each other. Some interviewees have given me samples of their work (like a cd of music, a book or a T-shirt) or referred new interviewees to me. These unexpected, little gestures are kindness in action in one of its simplest forms. Kindness turns followers into fans and clients into referrals, that is if they have something to be fans and referrals of. Which is where the hard work comes into play. This is how I interpret Conan O’Brien’s words: work hard for what you want in a non-cynical way and stay open to the opportunities that present themselves – and amazing things will happen.